The peace I long for is just and sustainable. It is shalom, the fullness of life for all and respect for the integrity of creation. I believe that we are called to live and act in solidarity with people and planet earth who are threatened, whether by violence or poverty or climate change and to work for a just peace. Peacemaking requires that we do our homework; that we learn which values, laws, practices, and policies are at the root of the violences in our world and that we work to change those values, laws, practices and policies wherever we can. 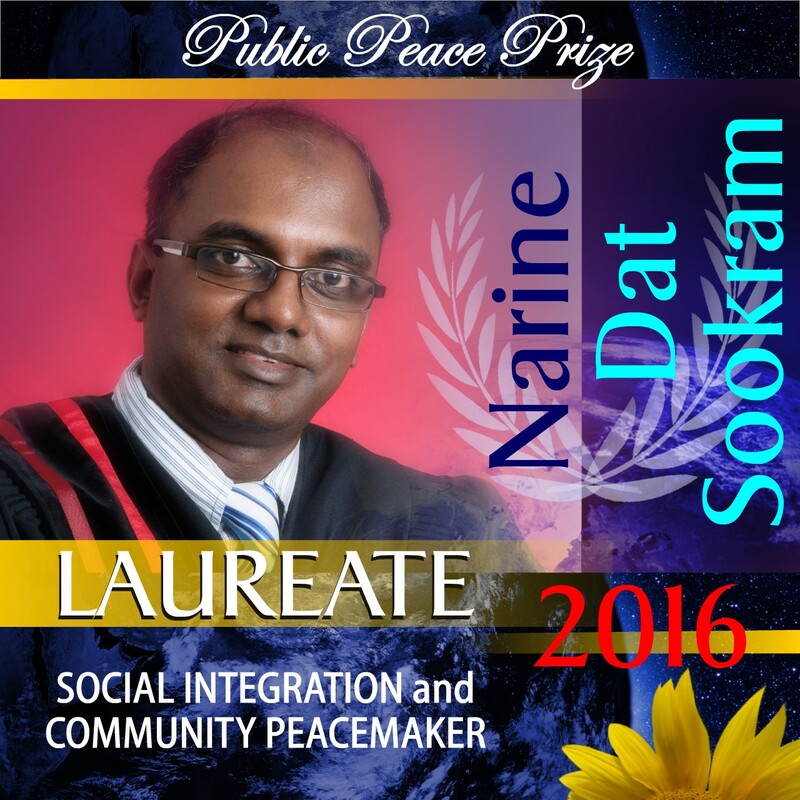 I believe that education for social justice and peace is crucial. My hope for the future lies in the courage of coming generations, who will create the world for which we yearn. For now we need to hear much more about the great work for peace that is ongoing in every place where violence threatens to overwhelm. We need to hear contemporary stories of the heroes and heroines of peace, stories of courageous people giving their lives now to live and act on their deepest beliefs. We are all subjected to unquestionable assumptions that rest security in higher walls and stronger fences, more sophisticated weapons, bigger prisons and fear of the “other.” But we who would be peacemakers are called to define security in a different way – as freedom from want, freedom from fear, solidarity and community. We are called to commit our lives to active nonviolence; to live simply; to act with courage for social justice. As a Christian peacemaker I listen with great care to Jesus’ words: Feed the hungry. Clothe the naked. Visit the sick and the imprisoned. Give drink to the thirsty. Welcome the stranger. Love your enemies. Do good to those who hate you. Turn the other cheek. Sell everything you own and give the money to the poor. Love, justice, active nonviolence, solidarity, inclusion, compassion, community, generosity, integrity … Peace: a clear invitation to a happy and meaningful life! Thank you for the honour you have bestowed upon me. I am humbled by this acknowledgment of the work I do with my colleagues in the Institute for Healing of Memories. In our Institute for Healing of Memories, we say that all people have a story to tell, and every story needs a listener. Whenever we are able to listen with compassionate hearts to one another, we find that it is our shared pain that connects us. A key element in peace making is the full acknowledgment of how people have been wronged, and the opportunity to be heard. To break the chain that turns victims into victimisers, there needs to be safe and sacred spaces where people have permission to express how they feel about what happened to them and begin to detoxify. Dealing with the psychological, emotional and spiritual effects of the past are equally as important components of peace building as political, economic and social transformation. 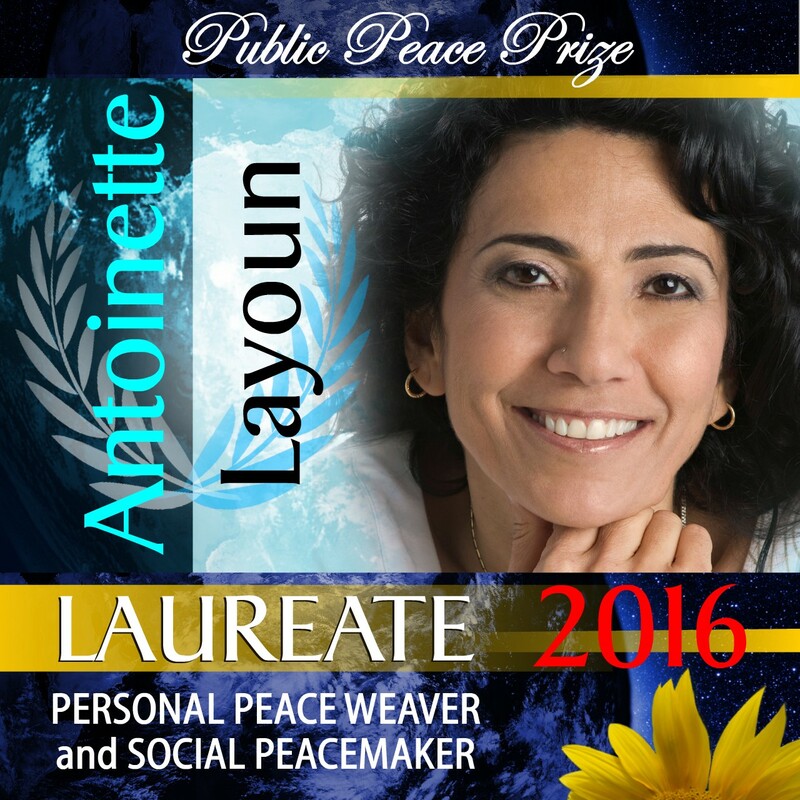 It is with great honour that I received the Public Peace Prize, 2016 – Laureate in the category of PERSONAL PEACE WEAVER and SOCIAL PEACEMAKER. With my whole heart, I would like to thank the organizers of this event as well as all the other nominees and it is important to me to acknowledge their work on behalf of peace. I would also like to thank all the people who participated in my nomination. I was deeply touched when reading one message after another and seeing the impact one person can have to bringing peace. 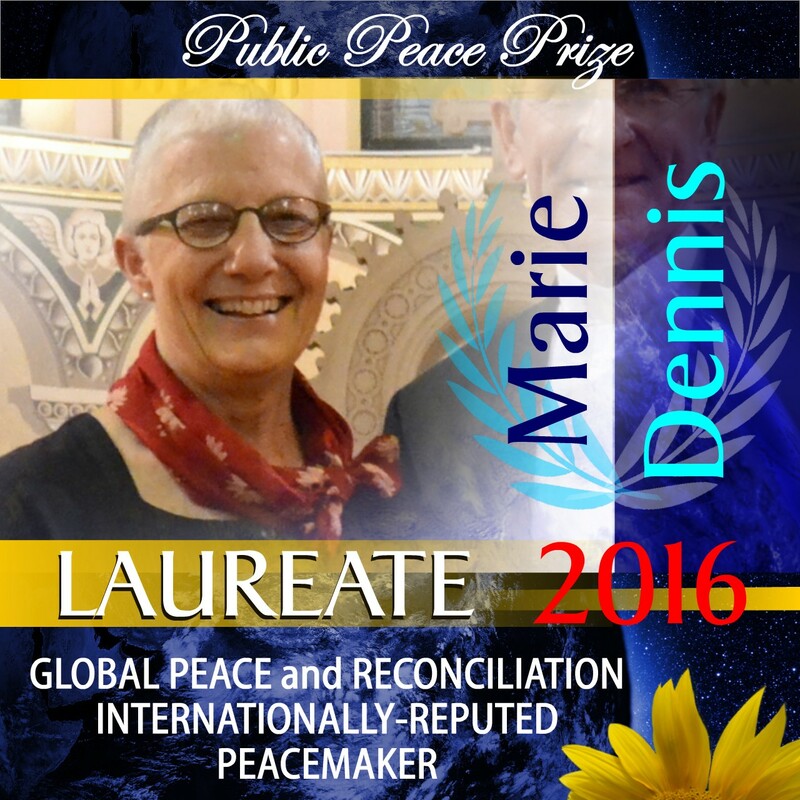 Thank you, to all of you, for your involvement and for being part of this peace consciousness. When I look at our humanity, I realize still more how important it is to demystify this Work for peace. We seem to have the impression that war is occurring uniquely between countries and factions. However, what I see is the importance of looking to the inner wars which are often present in each person, in his or her relationship with themselves, and in relationship to the other. In order to change the exterior world, it is important to look to our interior world. Having been a child soldier, I propagate the good news that the work for peace belongs to us. Instead of treating the exterior problem, one must go to the source… our interior world: who we are and what lives within us. ‘Be the change you wish to see in the world’ a great sage – Ghandi – one day said. He was, and remains, a mentor for us all in relation to peace. In the past, I wished to change the world. The day I realized that change begins within, I began travelling my own initiatory path of peace. I was a child soldier. I learned to see the other as an enemy and in order to survive and defend my own; I picked up a machine gun and bombs. After that, I wanted to change the Earth for I had understood how we are manipulated to be at war. Life brought me to the discovery that wars are being waged inside of us. My work for peace is to bring each one of us to pause, and allow ourselves to see within ourselves the difference we can make today, to be at peace and to live in peace. I am inviting each person to inhabit the presence within themselves, in their daily lives, as an endeavour for peace. The emotional, mental and relational states are good reflections of the state of war, or of peace, dwelling within each of us. Stress, fear, conflict, the struggle for power, belittlement of oneself or of insecurity and differences are manifestations of internal imbalances which lead to unconscious reactions of waging war against the self, or toward another. By becoming the change we wish to see in the world, we can imagine this world developing within the consciousness of peace! Causes which are also very dear to my heart within this work for peace is the status of children who are abused and the status of women. We must open our eyes and denounce all forms of abuse and injustice. The work for peace belongs to us all. Let us become artisans of peaceful hearts in our own relationships to bring about a better world! This is my biggest dream, and I hope you share this vision of a radiant earth and humanity. 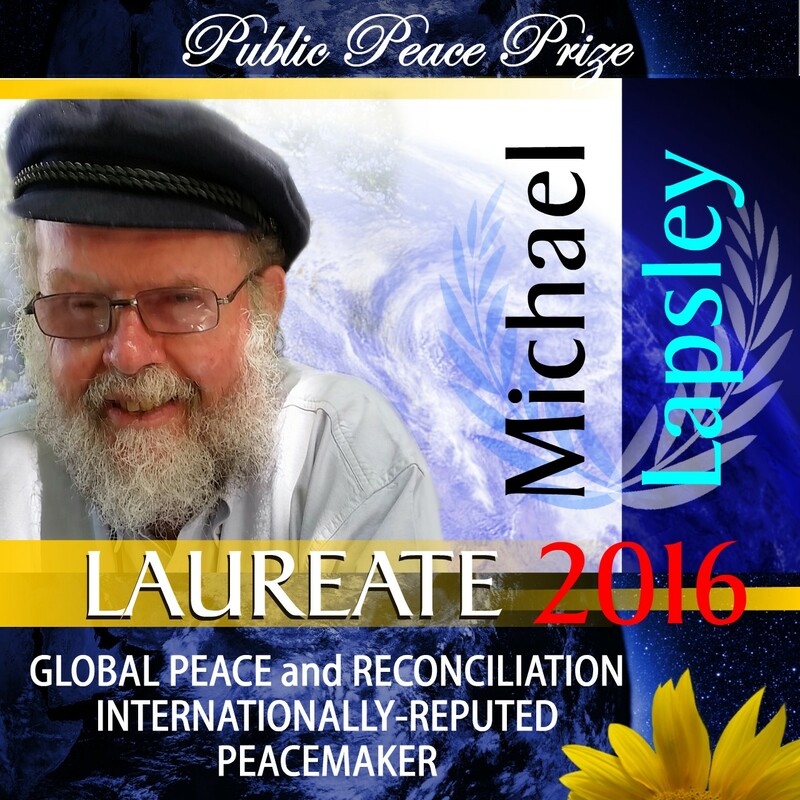 Together we are making a difference through the consciousness of peace! When it comes to peace I think the most important thing for me is to have people come together to celebrate life together as one. I also think that it is time that people look beyond our differences not only to respect each other but to make sure that every human being has equal opportunity. One of the things I try to put into practice is to live my life with a conscious mind, because I believe that peace itself starts from home and I think that it is everyone’s obligation to be part of the process. However, because of my passion for a more peaceful world, I have initiated a community concert and a community radio show to spread the importance of peace. In particular, with the Caribbean Dreams Concert, I showcase talents from different cultures and the idea behind it is that I want the broader community to have a better understanding of other cultures, because I strongly believe that the more people are knowledgeable of other cultures the less likely they are to be judgemental. But when I really come to think about it, there is no better way to promote peace than to have a diverse set of ethnic backgrounds under one roof, because to me it is the best way to breaker the barrier between our differences. My weekly community radio show is another initiative that is a powerhouse that I use to promote peace. The good thing with this show is that I get to choose the type of songs I play and usually it’s songs that the Caribbean/West Indian people can listen to and feel a sense of home. But best of all I get to connect with my listeners locally and internationally where I get to influence them in a positive way. I really want people to know that there is not a specific formula to promote peace in the world around us, but it is surely possible when we can work together to achieve a common goal. Though the world is divided, it is up to us to make that history.